The First Family became the fastest selling record ever, a status it has held long enough to be the answer to a Trivial Pursuit question. In the four weeks after its release in late 1962, the album sold 4 million copies, a figure it took the "My Fair Lady" sound track, the previous all-time best seller, one year to achieve.All in all, about 7.5 million copies sold and perhaps millions more were given away after the president's death made them un-marketable. Appearances on the Ed Sullivan Show and The Tonight Show furthered Meader's recognition The album's sensational popularity also boosted Cadence Records, the plucky upstart which guessed right on the mood of the nation, showing up the Manhattan giants which had flatly refused to produce the album. Did Meader or the album's producers encounter even an iota of the negative reaction the established record companies were certain awaited anyone foolish enough to parody a president? "No. In fact it got both sides of the spectrum," Meader said in an interview he granted during a walk through Hallowell. "Die-hard Republicans would say, 'I like the way you made fun of them Kennedys.' And die-hard Democrats would say, 'Gee, I like the way you did Jack.' Most of the reason for its success was that it transcended age and politics and just about everything." As we all know, it didn't last. Meader was on a cab ride in Milwaukee when he heard about the events in Dallas. His career never recovered. As Lenny Bruce said, they put two graves in Arlington -- one for John Kennedy and one for Vaughn Meader. PostScript: Believe it or not, The First Family is available on CD. Whether or not it's still "The Fastest-Selling Record Album Ever", it might make an unexpected gift for one of your AARP-type relatives who remember that era. If game developers and publishers insist on using third party DRM solutions, they should start releasing patches a year after release which removes the activation requirement. And I echo Gabe's sentiments-- installation limits are dumb. That is by far the worst thing that DRM has brought to the table. After all these years this is the first time I even thougtht about looking for the album. I had it - I laughed with it - I cry now - WHAT COULD HAVE BEEN!!!! I have this album. Does anyone know its worth? What a strange quirk of fate was suffered by Mr. Meader. To be hurled into instant stardom for one year and then just as quickly descend into hopeless obscurity must have been dizzying. 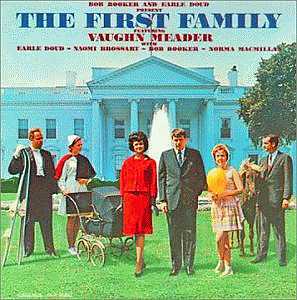 And unlike Tom Lehrer, who is still very much alive, entertaining was Vaughn Meader's chosen career. [Lehrer voluntarily went back to his career as a college professor after several years of popularity.] I remember the "First Family" album and it was such innocent fun that even Pres. Kennedy purchased copies to hand out as gifts. Those were happy times, but all too brief. About a year ago, I posted about dear old Tom Lehrer, and in the comments my friend Richard mistook Lehrer for Meader. As the discussion unfolded, I remarked that I thought Meader was dead, but a rogue commenter appeared and informed us otherwise.